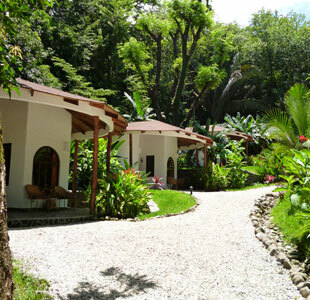 MANALÁ HOTEL is a cozy hotel witch 4000m2 of surface, surrounded by green areas and tropical plants. You will be able to enjoy its comfort and big quality, in a calm and exclusive environment, far away from other crowded tourist resorts. Our incredible location -so close to the beach with the best surge for the practice of surf (POINT BREAK) and our facilities, make MANALÁ HOTEL the only destiny for the best holiday ever Our hotel is inspired by a blend of the Caribbean and the Mediterranean worlds. It makes your stay easier by offering you the following: a private parking area, a restaurant, a swimming pool with a Jacuzzi, an area for sunbathing, and eight wonderful private bungalows (one of them has been especially designed for disabled people). Each bungalow is equipped with a safe box-big enough to store lap tops, Cable TV, free internet service, a mini fridge, a fan, warm water, a rest room with two sofas and table, queen size beds, and a small bed. They are all air conditioned. Every bungalow owns a big comfortable bathroom and a large terrace where you can admire the surrounding tropical vegetation, humming birds, squirrels, howler monkeys, butterflies and any other animals in the area. The bungalows are big enough for a family of three or four people. Hotel Manala is located a bit off the main dirt road that goes parallel to the ocean, and so our customers are ideally located just steps from other restaurants and shops, but still will enjoy the exclusivity of a noise free ambiance. Lots of guarded parking space. Santa Teresa is an area where lots of clients arrive in 4X4 . Guarded at night. Hotel Manalá is a luxury boutique hotel with a privileged location, just minutes walking from one of the world`s greatest beaches, Playa Santa Teresa. Hotel Manalá is an 8 unit hotel, offering a restaurant, bar, a beautiful swimming pool surrounded by green lush garden and vegetation and a friendly and professional staff, offering superb service. The bungalows are beautifully equipped and the décor blends in perfectly with the hotel main theme, luxury in a healthy relationship with surrounding nature, which in turn is the area`s most important attraction. 8 Bungalows Manala is a small, cozy intimate boutique beach hotel located at just 100 meters from the beautiful North End of Santa Teresa Beach. Activities ATV safaris, guided nature and adventure trips to National Parks, surfing, snorkeling and boat tours to beautiful islands.